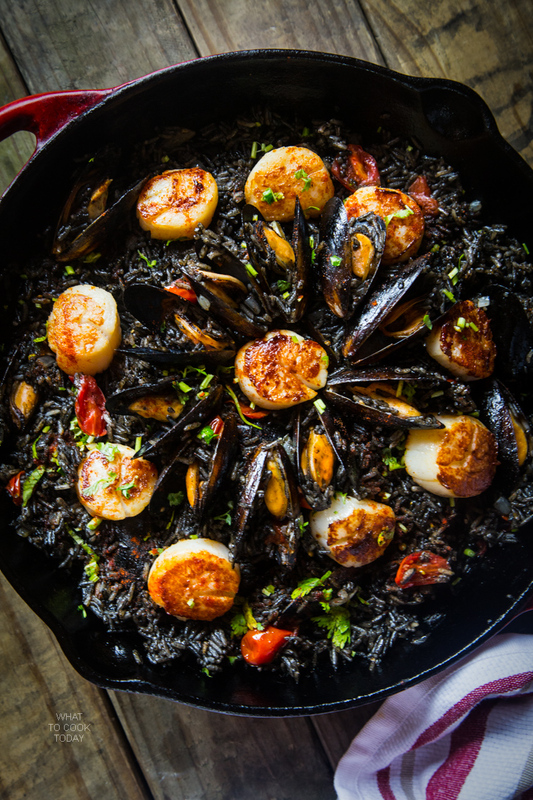 Squid ink seafood paella – A traditional paella with a twist by using squid ink. Squid ink adds a depth of flavor to the rice and while the color may not be appetizing, it is delish..
A small jar of squid ink that my husband brought home few months ago sure had been put into good use. I’ve made squid-ink pasta and squid ink risotto (will post recipe soon) with them and they were both so delicious. 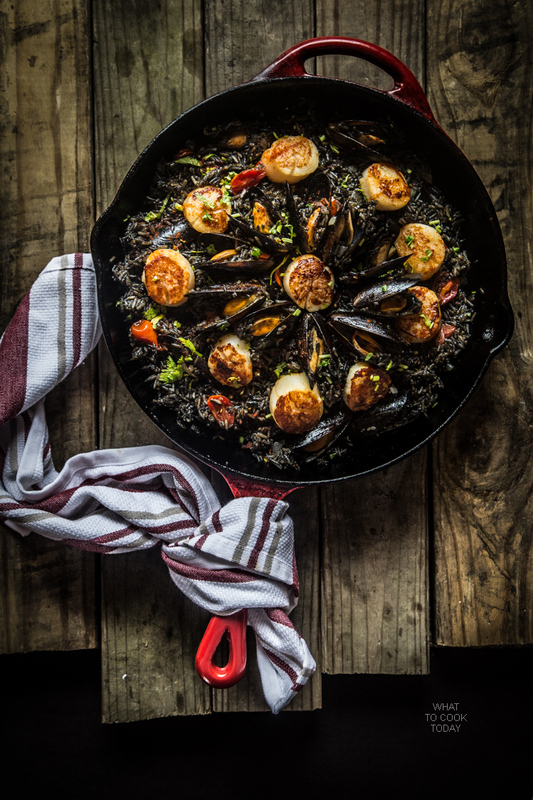 Now this is another dish that we love so much, squid ink seafood paella. Now, I know an authentic seafood paella uses the expensive Saffron threads and not squid ink 😉 Please forgive me my Spanish friends, I love paella with saffron threads trust me on this one. I was just so tempted to try it with squid ink. 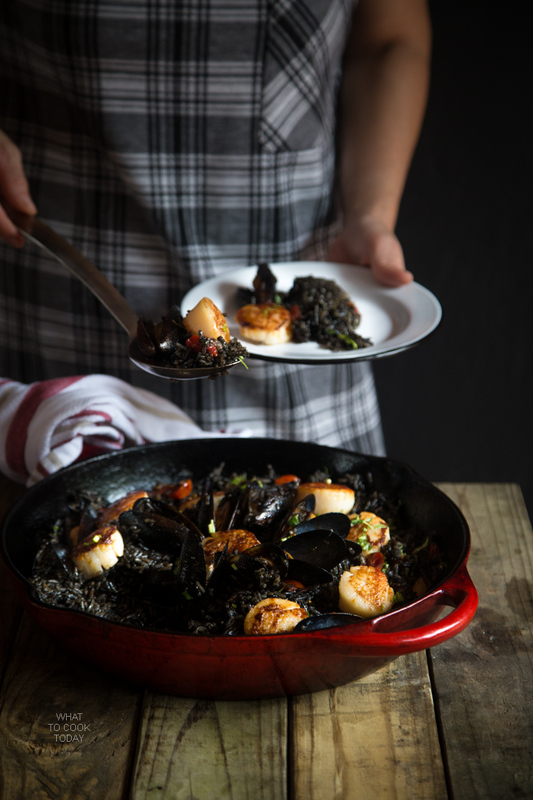 I didn’t alter much of other authentic elements of paella besides adding squid ink (okay..I know..major color change). 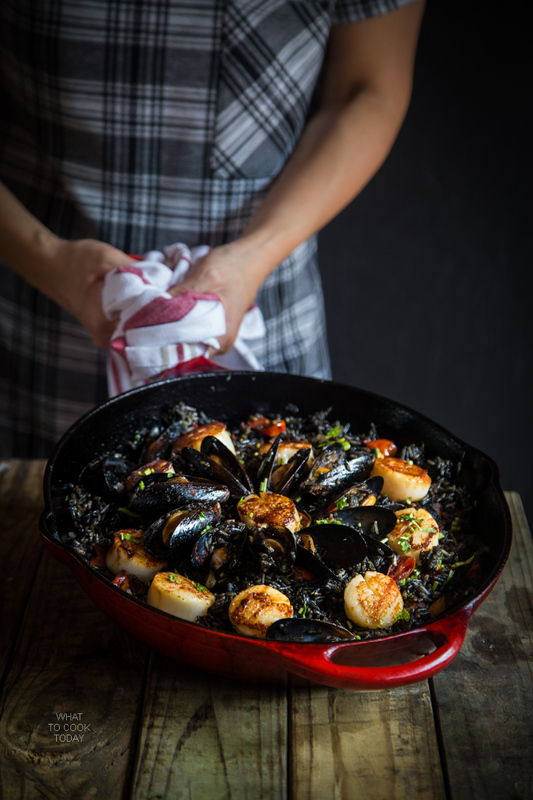 I still use sofrito as a base for this paella, which I think is absolutely necessary. I could have added saffron too, but I really don’t want so much flavors to get lost in one pan. I really want the squid ink to shine and so decided not to add in saffron. *This post contains affiliate links from Amazon. Thank you for your support. Place the ingredient for sofrito in a food processor and process until smooth. 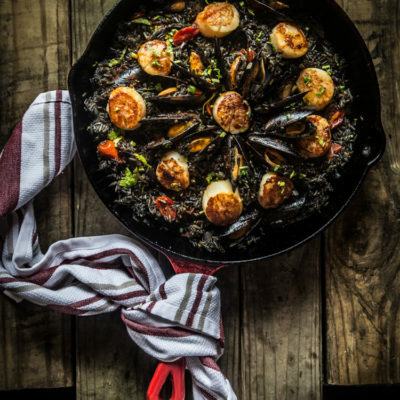 Preheat a large paella pan or if you don't have one like me, I just use cast-iron skillet. Add in cooking oil. Add in the sofrito and cook for about 5 minutes. Add in the smoked paprika, pinch of salt. Add in the rice and stir to combine. Add in the clam and squid ink broth into the pan. Spread the rice evenly on the surface of the pan. Bring the broth to a boil and then lower the heat to maintain a gentle steady simmer. The rice will gradually absorbs the broth and try not to disturb the rice while cooking, this will take about 10 minutes or so. 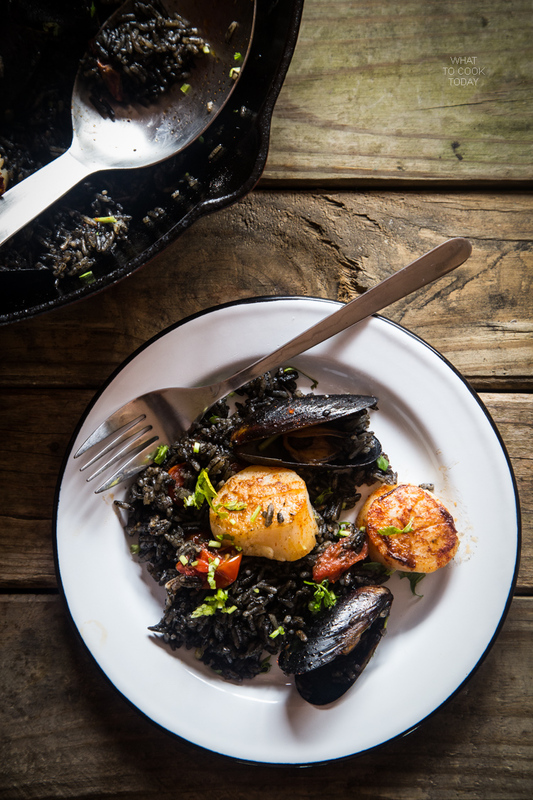 Arrange the mussels pieces on top of the rice and let them cook again for another 5 minutes. 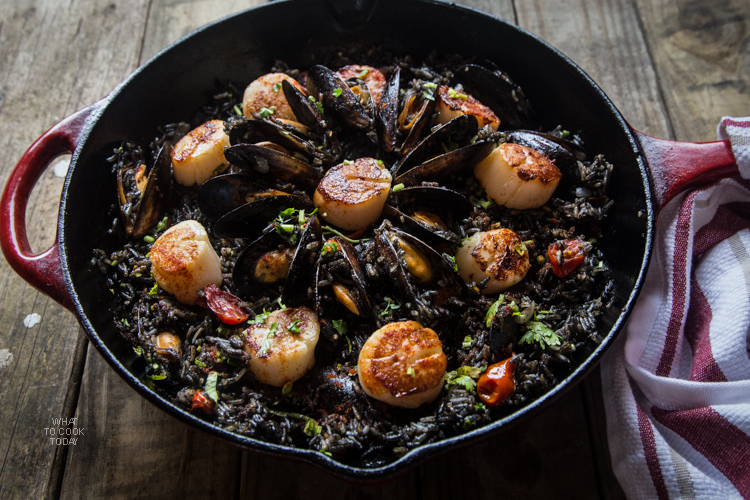 If the rice is cooked but the mussels are still not cooked through, cover the pan with aluminum foil and lower the heat and let it continue to cook until the mussels are cooked through. The cooked mussels will open up and discard the ones that aren't. this looks outrageously good! i must try. i, too, have used squid ink for things like pasta. and i’ve been a slave to the convention of using saffron in paella. i’ve been a little reluctant to use this explosive condiment in too many things. but this i have gotta try. my paella is requested regularly at large family gathering. boy, are they in for a surprise! Hello there, this looks great! Did you remove the seeds of the tomato? I did not remove the seeds for the tomato. Hope that helps.